This was a hot and steamy day but we got free tickets for Meatopia at Governor’s Island. We got off the ferry around 2pm and it was bright, sunny and hot. It was my first time at Governor’s Island and I was hoping to get some good photographs. Meatopia was fun and delicious, there were some interesting meat choices and good bear selections. As the afternoon went it started to get cloudy and dark at the Island. I was hoping to walk around the island and discover some good scenes and maybe a good view of Statue of Liberty. But as we leave Meatopia and started to walk around the island it started to sprinkle and then a steady rain developed. We decided to catch the ferry back to Manhattan and come back another day. As we were waiting for the ferry the sky just got even darker and it just poured, I was soaking wet. 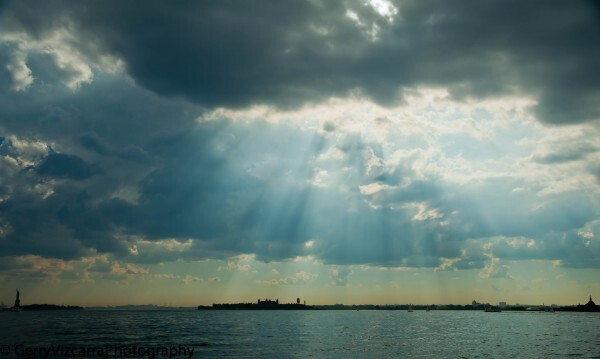 By the time we got off the ferry near Battery Park it stopped raining and the sky started to open up. We decided to go to a local bar right on the park. As we were drinking and celebrating with the group of Spaniards for winning the World Cup, I turned around and saw this view. I hurried and setup my equipment and took this photo. I consider myself lucky with this photograph cause I was at the right time and at the right place to take this photo. But this scene didn’t last very long, it may have lasted for 10 minutes. I’m a big proponent of knowing my equipment, including all the setting and features of the camera that pertains to my kind of photogaphy, so that when opportunities like this one present itself I can concentrate on the composition, my position and just photograph. I try not to fiddle with my camera and experiment with the settings while I’m shooting because I’ll end up spending most of the time figuring out my equipment and miss this great opportunity. Thanks and please as always leave questions or comments and photo critique. I’m always interested in learning. I went for a walk this past Thursday to take photograph of some local scenes. I live in Harlem, NY and I ended up walking south on the Hudson River Park/Greenway Park. 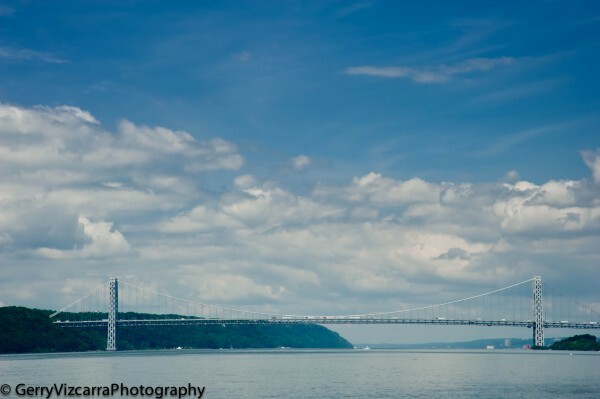 I wasn’t really sure what I wanted to photograph so I just decided to walk south and as I was walking I turned around and I saw this view of George Washington Bridge. I wasn’t sure if the photo was going to work out since it was the middle of the day, very sunny and very bright. To get the color of the sky I used circular polarizer and I underexposed by 1 to 2 stops. I got some dramatic sky and you can see some traffic on the bridge. It was getting too hot walking by the river since there was no shade, so I decided to walk across and head to Central Park. I entered the park on 93rd street and headed north. I was not familiar with north west area of the park so I just went to different paths and see if there was anything interesting to photograph. I fallowed group of kids and I found this little water falls. It was not the greatest light and the water was a little murky. I usually have my tripod with me but on this instance I didn’t have it. So both photos were handheld. For the water falls it was a little difficult because I had a longer exposure, even though I had VR lens I still had to hold the camera very still to avoid any shake. I took several shots and I was still getting some shake and blur. With the water falls photo I decided to use the live view feature to lessen the shake from the mirror movement. From the group of pictures I took this was the best one I think. I decided to convert it to black and white since the color wasn’t really interesting and to also cover some of the blur and shake still on the photo. Thanks for visiting. Please leave comments and questions. I spent some time with family this past 4th of July holiday. The family rented a beautiful house in Elkton, Virginia. It wass only a few miles away from beautiful Shenandoah National Park. We got there on Friday afternoon and it was kind of hazy but not so hot. The weather prediction for that weekend was hot and hazy, immediately I was concerned that it would be hazy Saturday morning when I was planning to go for a drive in the park. 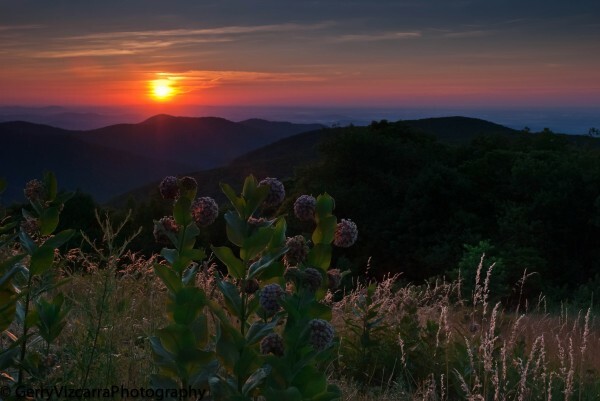 If you are not familiar with Shenandoah National Park, there’s a road that cut through the park called Skyline drive, it’s 105 miles long with many overlooks along the way. There were four entrance to Skyline drive and the closest to where I was staying was Swift Run Gap which was on mile marker 65. I decided to go up north, it took me a while to find a good spot or overlook. I drove for almost one hour north, mind you there was 35 mile/hr speed limit and there were lots of wildlife. There were lots of deers on and side of the road, I even saw a skunk crossing the road. It was a very active morning for the wildlife. I don’t quiet remember the name of the overlook but I think it was either Hemlock Springs or Thorofare Mtn Overlook, when I got to the spot, there was another photographer there and I was sure then that I’m at a good spot. It turned out to be a beautiful sunrise. The sky was beautiful and the sunrise was amazing. The sun was coloring the white cloud with its reddish orange color and in the background the blue sky was just magnificent. The vast mountain pics and valleys on the middle ground and the beautiful flowers and grass on the foreground were just beautiful that morning. I suddenly didn’t mind waking up at 3:30 am to experience and photograph this magical sunrise. In the end it was all worth the trouble waking up and driving for miles. Let me know if you have any questions or comments. Enjoy the photo. Here’s another photo from the B&H Lensbaby Urban Photo Safari workshop. The instructor gave us a list to photograph in Central Park and this is one of them. 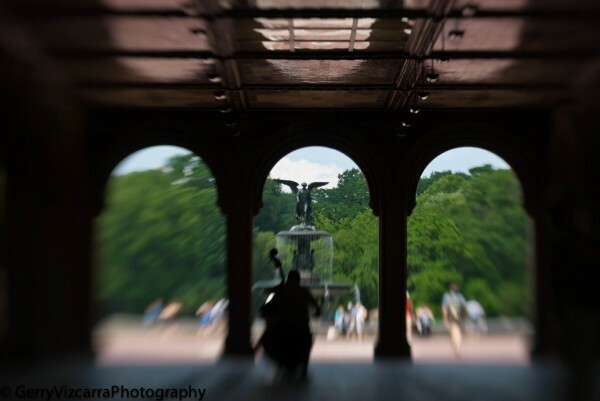 We have seen many photographs of Bethesda fountain and I wanted to create a different view or perspective. 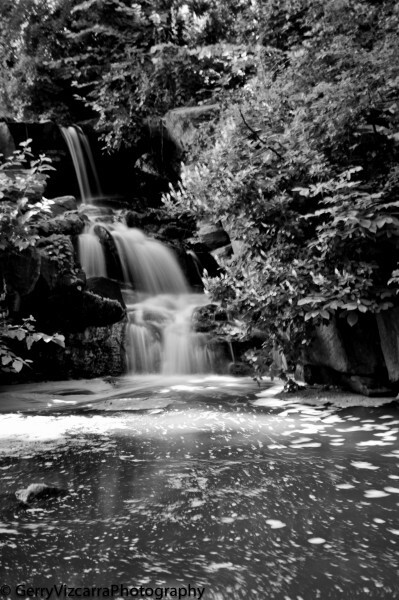 I have seen similar photograph of the fountain but not with the same effect as with the Lensbaby. I knew I wanted to photograph the fountain but I wanted a different view or angle. I was happily surprised to see the cellist playing and I knew I wanted to incorporate him in the picture. I took several shot of him but I wanted the angel and the fountain to be part of photograph. So I came up with this photograph of the fountain and a silhouette of the cellist. I was hoping to just photograph the fountain and the cellist but it was summer and in the middle of the afternoon in NYC, but I think the picture still worked out. Let me know if you have any comment and/or questions.